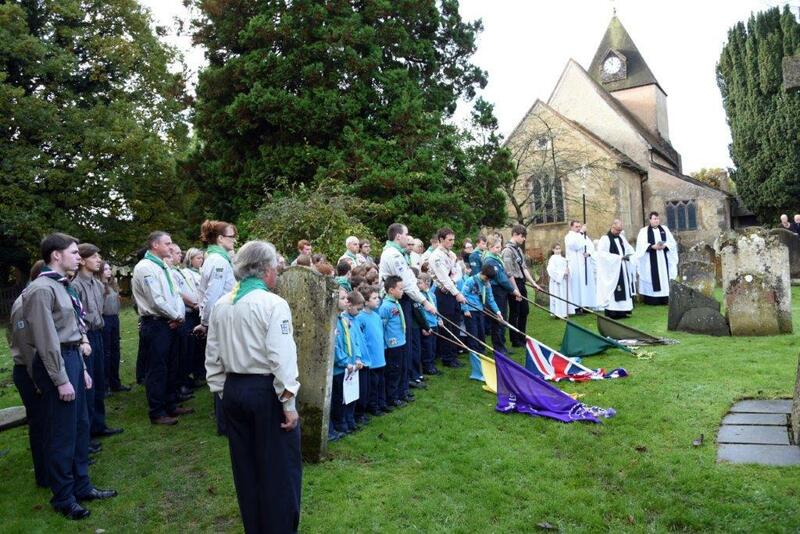 On Remembrance Sunday (13th November) the residents of Ifield, the congregation of St Margaret’s Church and 2nd Ifield (St Margaret’s) Scout Group gathered around the war memorial in Ifield churchyard for two minutes silence and wreath laying. The ceremony, with the last post and reveille, included prayers, remembering those who had died in wars and for peace. The ceremony at the war memorial was preceded by a service St Margaret’s Church attended by 100 Ifield Scouts plus their families which left some people standing. The Rector of Ifield, Revd Simon Newham, lead the service and the assistant curate, Revd Jamie Gater, preached. The service included a commitment to work for peace. The Scouts and the congregation for the normal Sunday service joined together at the war memorial before the second service moved into the church. Brian Eastman, Group President for 2nd Ifield Scouts, congratulated members on the large number of Beaver Scouts, Cub Scouts, Scouts, Explorer Scouts and Scout Network members present in church and at the war memorial. Elsewhere in Crawley to recognise Remembrance Sunday, 1st Langley Green joined the Crawley Town Parade and 7th Crawley attended a service at St Andrews Church, Furnace Green.